Send messages and make video calls worldwide to several people at once. 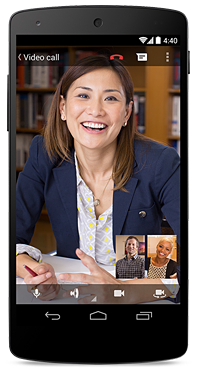 Hold impromptu meetings on the go, virtual training classes around the world, remote interviews, and much more. Host Hangouts for up to 15 people within or outside of your organization. The screen automatically focuses on whoever is speaking and intelligent muting prevents background noise. 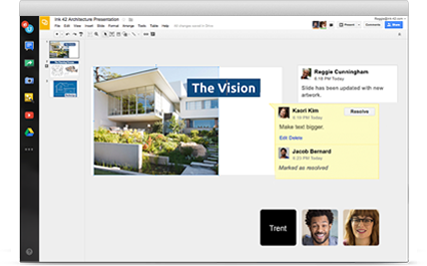 Your entire team can join the same Hangout from their desktop, laptop, tablet or phone with the same easy-to-use experience. Review your latest slides or give a remote tutorial with easy screen sharing, then send around useful links with built-in chat. Hold a public Hangout On Air to demo a new product or make an announcement. Your video conference streams live in HD and is automatically saved to your YouTube channel. When creating a meeting in Google Calendar, you can automatically add a Hangout. So when your meeting rolls around, it takes just one click to join. Set advanced admin features like limiting access to Hangouts for external participants, turning chat history off and the ability to eject participants ensures privacy. Yes. External participants can join a Hangout even if they don’t have a Google Apps account. To ensure privacy, you also have the option to restrict access to Hangouts by default. Yes. All video and audio streams in Hangouts are encrypted. Users can join securely even if they’re offsite. Hangouts are limited to 15 participants, with no time limit. You can also use Hangouts On Air to broadcast a Hangout to as many people as you like. There is still a limit of 15 active participants.